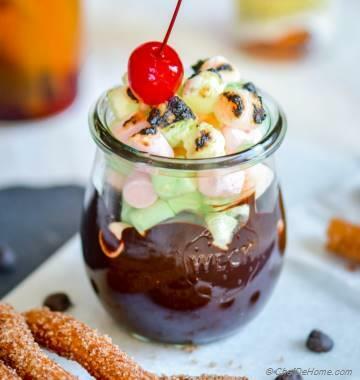 A 'Churro' Breakfast with indulgent touch of chocolate!!! 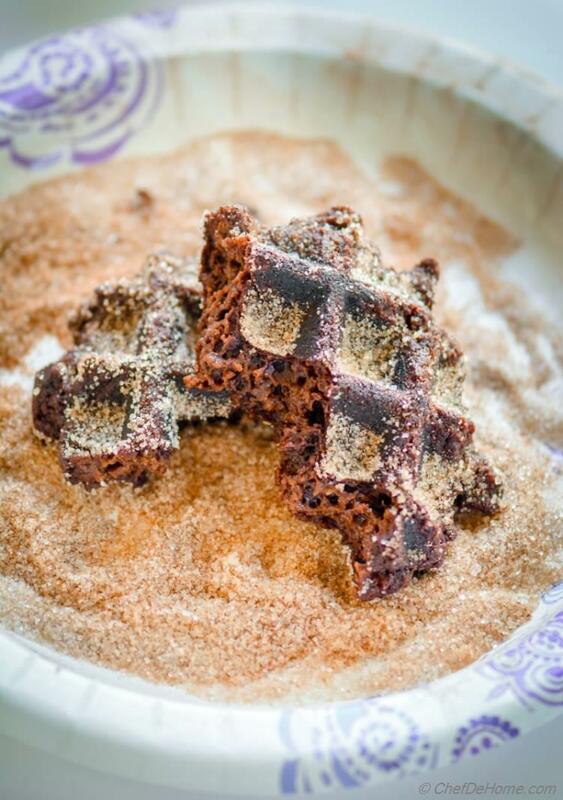 Breakfast just got better with a 20 minute nostalgic fair-style cinnamon-sugar churro turned to a crispy Chocolate Churro Waffles. Yeah! 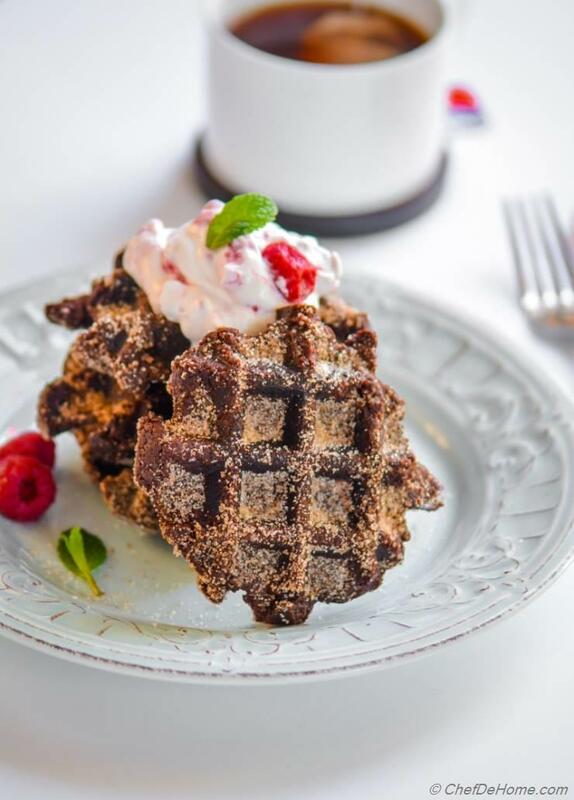 Starting Monday with an eggless, crispy, churro Waffles for breakfast with cup of hot chai tea! Oh - and guess what? 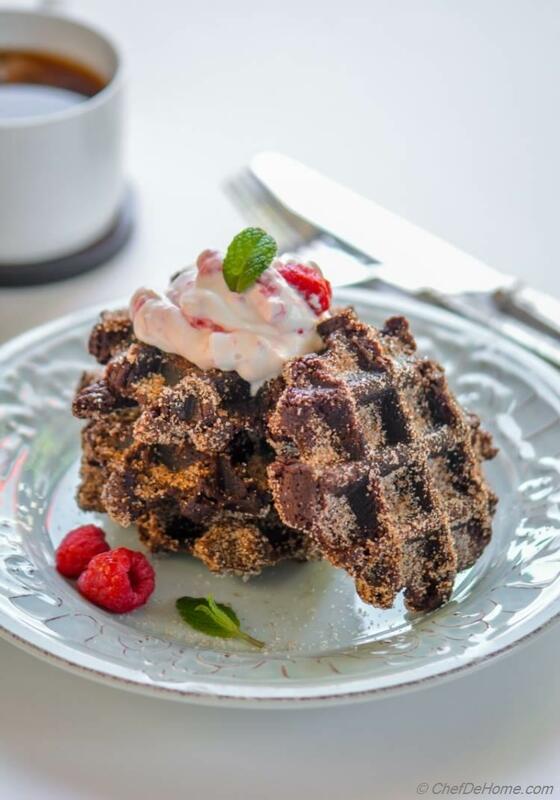 These churro waffles come together so fast, I never have to think twice before making a batch! Chocolate churro recipe is my re-take on eating churros crisped without fryer in the metal plates of my iron waffle.. this time I made them with chocolate. Actually best way to eat churro is: hold in hand and munch away! Total street-fair style! But it won't be that nice to make both hand busy, one holding chocolate and one churro! Hence? Chocolate Churro! I clearly remember, when I shared the first churro waffle with you.... Everyone loved it so much... a few nice people even took time to right to me about how much they enjoyed eating those eggless waffles. I can totally understand their response since these churro waffles taste additively delicious! For me, breakfast can not get better than this! 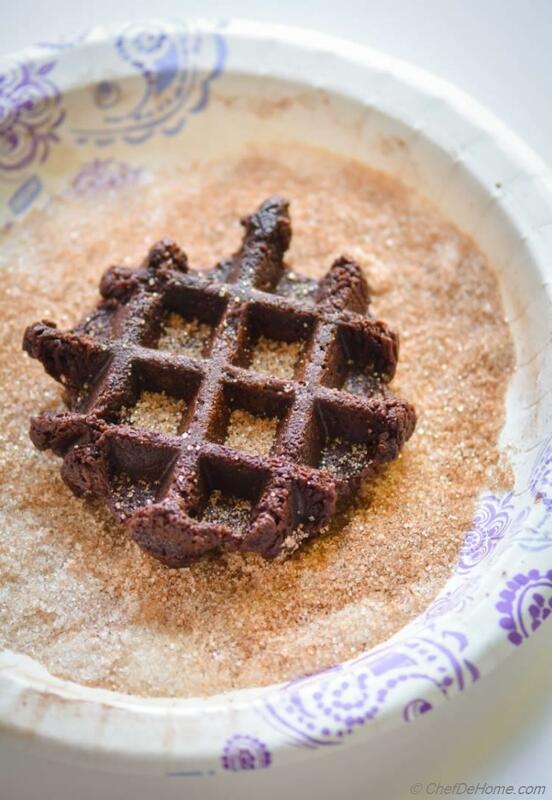 Two metal plates of Waffle Iron make churro dough extra crispy... yet leave the center moist, warm and so scrumptious! Being a churro fan yet looking for a non-fried version... I had full plans of baking the churros that day. Only one though hold me bake. Churro dough is just like choux pastry dough (minus eggs) which is used to make cream puffs. I was skeptical if churro dough will bake and get crispy or will puff up like a cream puff! So my waffle iron sounded just the right tool to make churro crispy without oil. The baked version is still waiting in my to-do list. 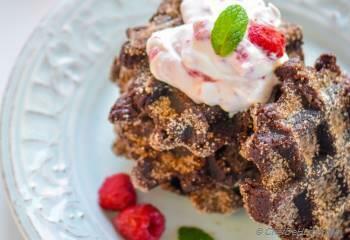 btw, is it safe to call'em "Choco Chaffles"?! Even though these churro look chocolaty delicious... I must tell you that I have only used raw cocoa powder for the chocolate part of churros. You are more than welcome to use regular chocolate (melted) or even Mexican chocolate too. 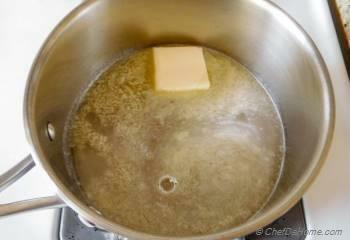 Just mix it after mixing flour into the butter and water. I always have raw cocoa powder handy at home to add in smoothies. So mostly I use cocoa powder instead of chocolate block in lot of my chocolate recipes until if I have planned a recipe which needs buttery chocolate. If you have Hershey's Unsweetened Cocoa at home, you can use that too. Other than chocolate, basic churro recipe is just mix of 5 simple ingredients, good old AP flour, butter, sugar, cinnamon, and salt! (and no eggs like street churros) Eggless churros are far more light than street churros. So please never add eggs to churros. Picture below is a proof! Such airy texture and no eggs! 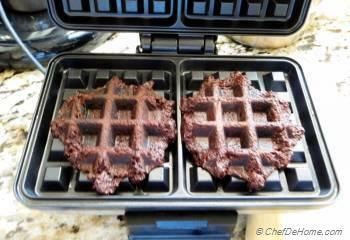 Just simple ingredients and good friend - Waffle Iron! How good does that look? Toppings!? Ah! That's tough one! I'm such a "churro" fan that I would eat one just slathered in cinnamon sugar without any topping. If you serving this for Sunday brunch or treating your mother for a surprise Mother's Day Brunch? I would say please don't skip toppings. 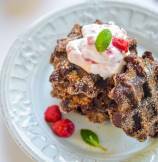 Nothing too fancy... Just a dollop of sweet whipped cream with fresh chopped strawberries will make "Chocolate Churro" a delicious breakfast or a buttery sweet finish to a delicious Brunch! Every time..... I meant, EVERY time, my drooling love for Churros triggers just when I cut open waffle... in attempt to take few more clicks. I hope I'm starting your week with a delicious yet healthier frying-free egg-less breakfast. 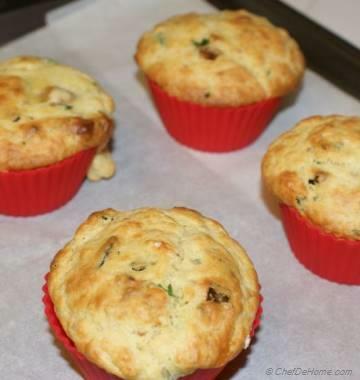 Bookmark this recipe to give it a try coming weekend. 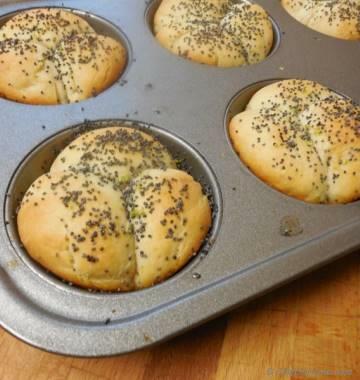 Smart Swap Use part whole wheat and part AP flour, to add some whole wheat goodness to your breakfast! 1. 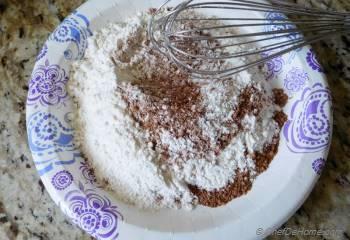 In a plate or bowl, mix flour with cocoa powder until well combined. Set aside. 3. Reduce heat to lowest. 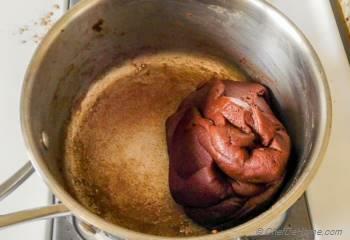 Add cocoa and all purpose flour mix into water. And use whisk to combine. 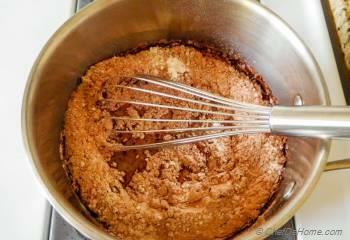 I often combine the flour into water with whisk, so as to avoid lumps, and then fold dough using spatula while cooking. 4. Cook dough on medium heat for 1-2 minute until dough comes together and thin film form at the bottom of pan. Remove dough from pan on a to plate and divide into 4-8 equal parts depending upon size of waffle iron. I divide dough into 4 parts. 5. 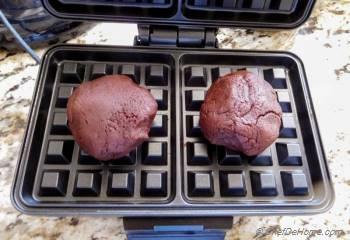 Spray waffle iron with cooking spray, then place two portions of dough on hot waffle iron. Cook for 5-6 minutes or until waffles iron indicator is green. 6. Transfer the hot waffles into a plate with cinnamon and sugar and coat generously. Repeat steps 5 and 6 to cook remaining waffles. 7. Fold sliced strawberries into sweetened whipped cream. 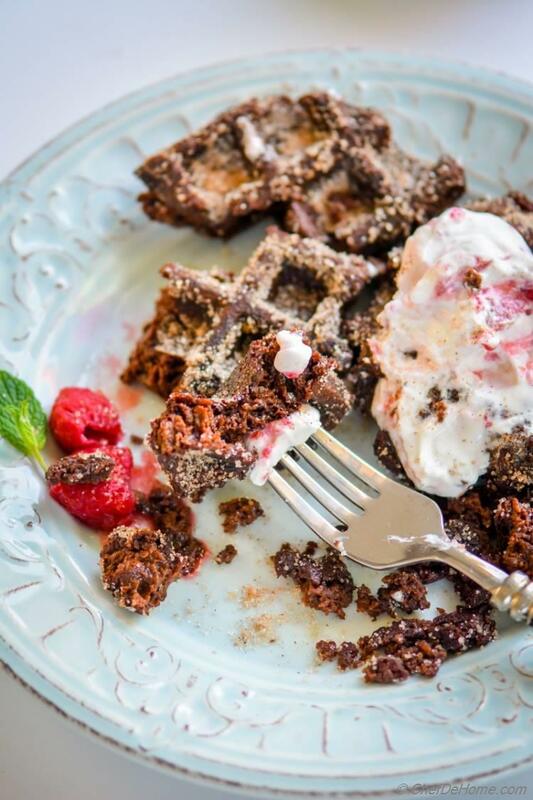 Serve waffles hot with strawberry whipped cream, serve and enjoy!